Couple kissing in the rose garden at Springs Preserve in Las Vegas. 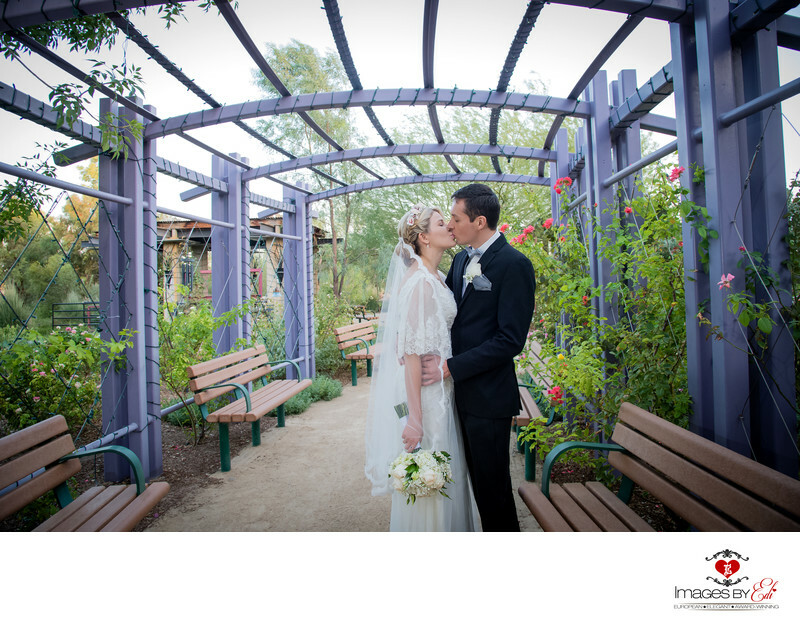 The purple structure with the blooming colorful roses give a beautiful frame around the couple. The Springs Preserve is the birthplace of Las Vegas, was built on the land what was once home of natural springs. It's a nice compliment to the vibrant Las Vegas Strip, what is just a short driving distance away. The 180-acre cultural and historical attraction is home of exhibits, galleries, hiking trails and Botanical Gardens, which includes themed gardens, showing how can you create themed garden in your own space at home. Next to Mojave Cactus and Succulent Collection, palm garden, veggie and herb garden is the rose garden, what is one my favorite locations for pictures.